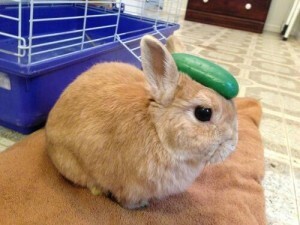 Can you give your rabbit cucumber? Cucumbers are naturally cool. Its internal temperature is usually around 20 degrees cooler than outside temperature. Cucumbers can be a great addition to a healthy human diet as they are 96 percent water. The extra smooth skin of the cucumber helps keep the water in like a quality jug. The silica found in cucumbers is an essential for healthy connective tissues, such as the tendons, ligaments, cartilage, and bone. 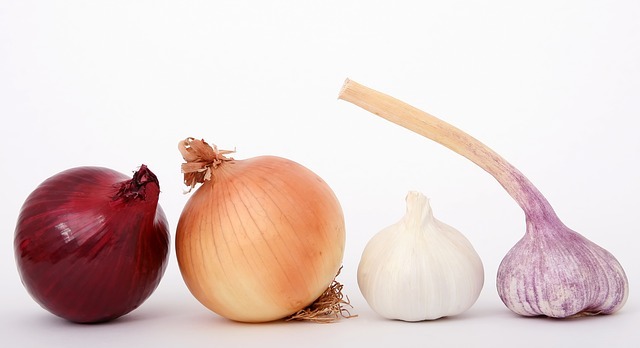 This food is often recommended to improve skin health and complexion. Because of its high water content, cucumber offers natural hydration, making the skin glow. But can rabbits eat cucumbers? Cucumbers can be a healthful and fun snack for your rabbit but not to a greater extent. Don’t feed him too much as it can cause digestive problems that could lead to runny stools (rabbit diarrhea) and a poor appetite. Cucumber is not a nutritionally dense food for your bunny. It lacks most of the nutrients that your pet needs to stay healthy. Cucumbers and iceberg lettuce are both high in water content. They both may cause runny stools if you give your pet too much. You may give some cucumbers but only in very small amounts and as occasional treats only. If you notice signs of gas or diarrhea in your bunny, don’t give him cucumbers ever again. There are better vegetable choices that your pet will surely love. 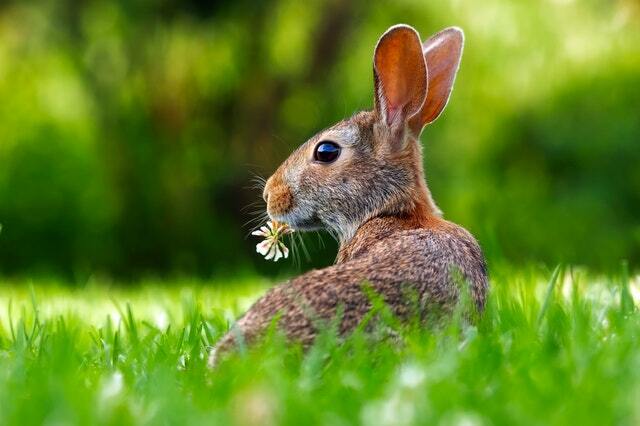 Because rabbits are herbivores, their digestive system is adapted to eating hay. Their guts are designed to house good bacteria that ferment the hay. When you feed your pet foods that are fermented easily, it allows bad bacteria to outnumber the good bacteria. Bad bacteria in your rabbit’s digestive system would lead to gas, making your bunny feel uncomfortable and eventually lose appetite. The unique digestive system of rabbits requires high in fiber and low in protein diets. 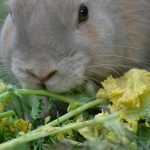 The components of a healthful rabbit diet are grass, hay, fresh vegetables, pellets, and plenty of water. 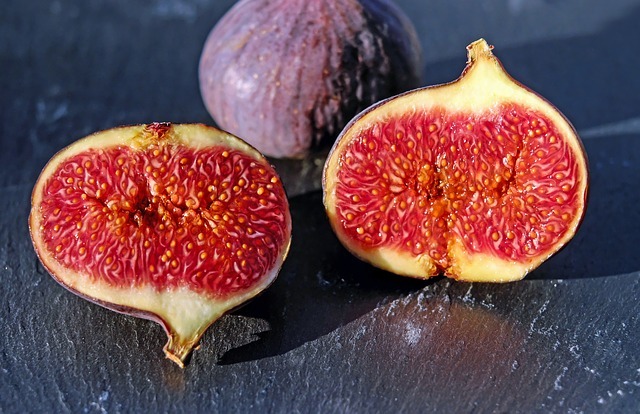 Treats such as fruits are acceptable but should likewise be given sparingly. Your pet’s health and longevity greatly depend on what you feed him. Perhaps the best snacks to give your beloved pet are those that are fresh and that will aid in his digestion process. But never overfeed your rabbit with fresh food as he may rely solely on these foods for nourishment. And do not forget to wash fresh foods thoroughly to ensure that your rabbit is safe from pesticides and other harmful chemicals. 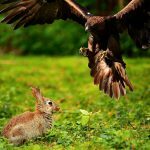 Although fresh vegetables are essential to meet your rabbit’s nutritional requirements, be very careful in choosing the kind of vegetable for your bunny. Ensure you’re only feeding your pet those vegetables that contain the essential vitamins and minerals for him. Not all vegetables are good and safe for your bunny. It is best to do some research first. A few words about pellets. 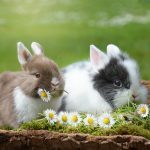 Although rabbits survive on diets that consist mainly of grass, hay, and vegetables, giving them pellets could be beneficial as well. These foods, if you know how to choose the quality ones, could provide added vitamins and minerals to your pet’s food. Also, remember that rabbit nutrition varies according to age. When shopping for pellets, consider the age of your bunny. Choose foods that are not high in energy and protein if your pet is already an adult. Adult rabbits tend to become obese when fed with too many pellets. They must be fed only with high fiber foods. So read the label carefully. Only give him foods that are designed for his age. 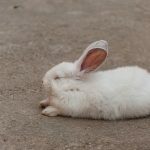 If you notice that your bunny starts to gain too much weight, then it is suggested to reduce his pellet consumption. 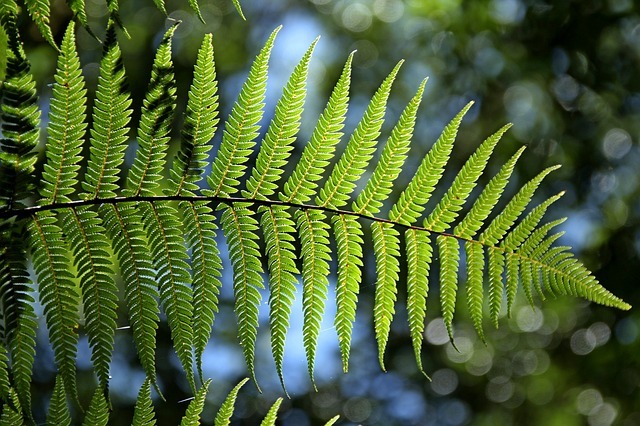 Instead, feed him with more fibers such as grass hay and other green leafy vegetables. Aside from grass and vegetables, rabbits are also attracted to sweet foods. However, such foods will cause harm to your bunny. 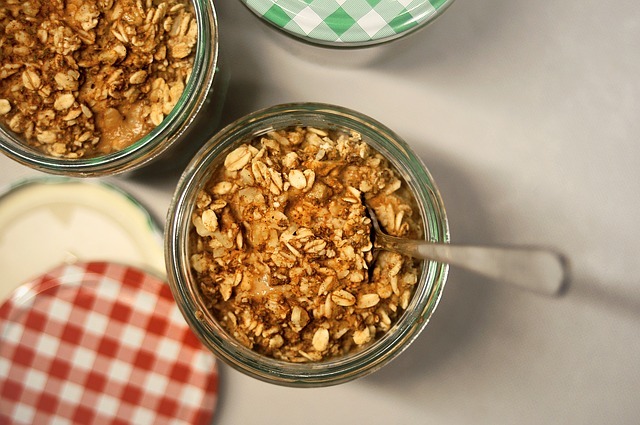 Although you can give treats once in a while, sugary foods should not be your option. Instead, give him fresh foods such as fruits and vegetables. Never give him too many treats though, as it may interfere with his regular meal schedule. Here are the right proportions: hay (80%), fresh foods (10 – 15%), and pellets (10%). 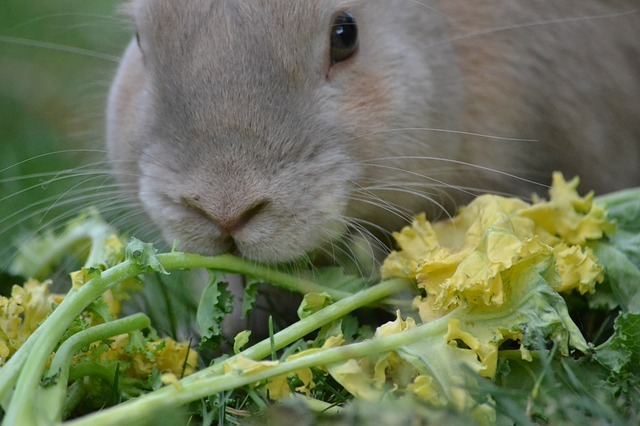 Rabbits will naturally nibble on any kind of food you give them. Their instinct tells them to constantly chew as their teeth grow quite rapidly. That’s why you have to be sure that you only give what’s best for your pet. 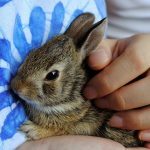 To help keep your bunny active and healthy, always give him a variety of healthful meals and treats.